Shaving is one of the daily tasks in a man’s life that never stops irrespective of age. 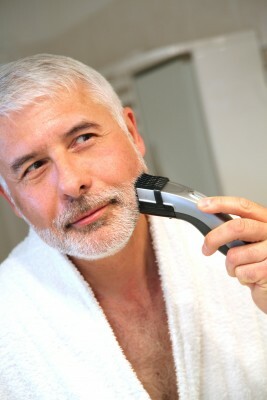 Although not much thought is given to the process of shaving, it is important for elderly men to take note of several points that are unique to their age group. This is largely due to the age-related changes in the skin seen in the senior years. The faster hair growth on the bearded area of the face that occurs from around the forties onwards means shaving twice a day or more often increases the risks associated with age-related problems. Most men are comfortable with shaving and have adopted a specific way that suits them best. This does not necessarily mean that each individual’s process is best suited for hair removal and skin care. However, there is no specific routine that is the right way to shave. Some routines are better suited for minimizing skin injury, reducing skin discomfort, removing the hair as close to the skin as possible and preventing subsequent irritation and injury. Here are some basic steps that should be considered when shaving. Prepare the skin for shaving by washing the face with hot water. This not only removes any dirt and some microbes from the skin surface but also softens the skin. Shaving after a hot shower is therefore recommended or a hot towel can be used as a compress after washing with cold water. Apply a suitable shaving foam on the area and spread it out thoroughly with a shaving brush. Certain shaving foams are specially made for sensitive skin which may be necessary. Some men prefer a shaving oil which may be preferable in seniors where there is age-related dryness of the skin. Always use sharp blades or a good quality electric shaver. This reduces the need for excessive force on the skin during shaving and prevents cuts and scraping on the skin. Razor blades should be changed regularly and electric shavers must always be used on full charge or close to it. Shave in bright light. Rinse the skin with cold water after shaving to remove any remnants of shaved hair from the skin. An antiseptic aftershave solution is helpful in destroying the bacteria on the skin and preventing infections. However, these solutions tend to dry the skin excessively. An aftershave balm may therefore be the better choice. Nicks and cuts in the skin with shaving. Infections of the skin or hair follicles – bacterial or fungal. Skin damage and scarring in some instances. It is further complicated by certain physical conditions that are more likely to arise in the elderly. Diabetes mellitus where the chances of skin infection are greater. Parkinson’s disease, multiple sclerosis and myasthenia gravis where the ability to coordinate fine movements during shaving is impaired and there is greater chance of skin injury. Alzheimer’s disease and senile dementia where the memory and judgement is impaired to the extent that hygienic practices are not followed.